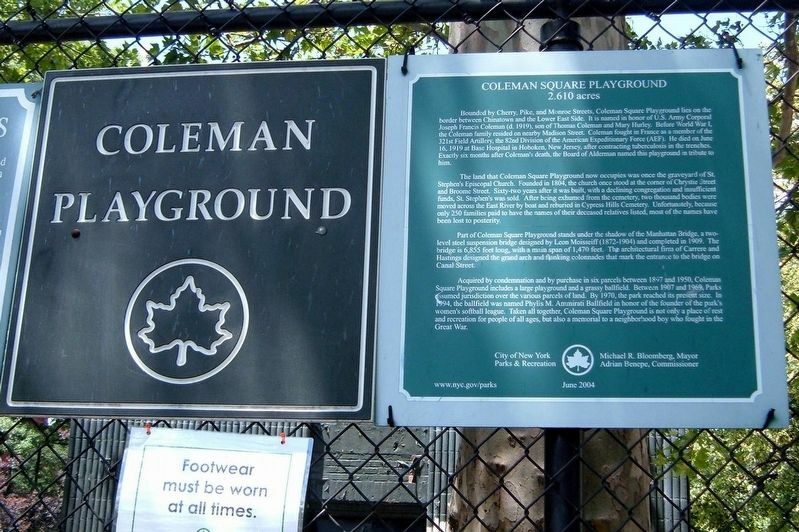 Bounded by Cherry, Pike, and Monroe Streets, Coleman Square Playground lies on the border between Chinatown and the Lower East Side. It is named in honor of U.S, Army Corporal Joseph Francis Coleman (d. 1919), son of Thomas Coleman and Mary Hurley. before World War I, the Coleman family resided on nearby Madison Street. Coleman fought in France as a member of the 321st Field Artillery, the 82nd Division of the American Expeditionary Force (AEF). He died on June 16, 1919 at Base Hospital in Hoboken, New Jersey, after contracting tuberculosis in the trenches. Exactly six months after Coleman’s death, the Board of Aldermen named this playground in tribute to him. Hills Cemetery. Unfortunately, since only 250 families paid to have the names of their deceased relatives listed, most of the names have been lost to posterity. Part of Coleman Square Playground stands under the shadow of the Manhattan Bridge, a two-level steel suspension bridge designed by Leon Moisseiff (1871-1904) and completed in 1909. The bridge is 6.855 feet long, with a main span of 1,470 feet. The architectural firm of Carrere and Hastings designed the grand arch and flanking colonnades that mark the entrance to the bridge on Canal Street. Acquired by condemnation and by purchase in six parcels between 1897 and 1950, Coleman Square Playground includes a large playground and a grassy ballfield. Between 1907 and 1969,m Parks assumed jurisdiction over the various parcels of land. By 1970, the park reached its present size. In 1994, the ballfield was named Phylis M. Ammirati ballfield in honor of the founder of the park’s women’s softball league. Taken all together, Coleman Square Playground in not only a place of rest and recreation for people of all ages, but also a memorial to a neighborhood boy who fought in the Great War. Erected 2004 by NYC Parks. 40° 42.642′ N, 73° 59.605′ W. Marker is in New York, New York, in New York County. Marker is on Cherry Street near Market Street, on the right when traveling south. Touch for map. Marker is in this post office area: New York NY 10002, United States of America. Touch for directions. Other nearby markers. At least 8 other markers are within walking distance of this marker. Manhattan Bridge (about 700 feet away, measured in a direct line); The First Chinese Presbyterian Church (approx. 0.2 miles away); Governor Alfred E. Smith Memorial (approx. 0.2 miles away); Happy Warrior Playground in Alfred E. Smith Park (approx. 0.2 miles away); Alfred E. Smith House (approx. ¼ mile away); Governor Alfred E. Smith Houses Residents Memorial (approx. ¼ mile away); The Eldridge Street Synagogue (approx. 0.3 miles away); St. James' Church (approx. 0.3 miles away). Touch for a list and map of all markers in New York. More. Search the internet for Coleman Square Playground. Credits. This page was last revised on April 14, 2019. This page originally submitted on April 10, 2019, by Larry Gertner of New York, New York. This page has been viewed 24 times since then. Photos: 1, 2, 3. submitted on April 10, 2019, by Larry Gertner of New York, New York. • Bill Pfingsten was the editor who published this page.